Happy Halloween! Today Ethan played with his Halloween Sensory Box! He's still not ready for any small bases to the box that he could choke on, so I used rice cereal (I tried to colour it orange and black, but it didn't work, so we went with plain). We put in a monster bowl, orange spoons, the pumpkin carving spoons and black spiders. Ethan loved using his senses to explore everything in the box. 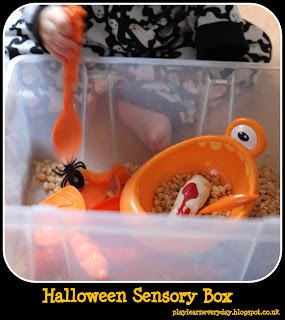 Sensory boxes are great for developing his Knowledge and Understanding of the World. He was scooping up the cereal, stacking up the toys, chewing on the spider (he didn't like that!) and of course having a little taste of the cereal too.